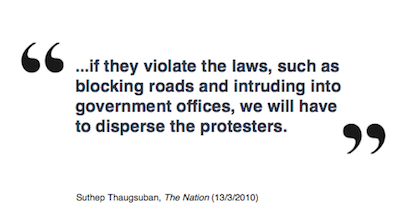 Suthep Thaugsuban issued a threat to UDD protesters before the 2010 military massacre. Three years later, and Suthep is now attempting to "shut down Bangkok" using precisely the tactics that he formerly condemned. In another example of hypocrisy, Suthep is campaigning against corruption despite his own reputation as a corrupt MP. Previous quotes of the day: the army chief on the GT200, a PAD leader says Thailand should be more like North Korea, the ICT Minister openly admits to violating the Computer Crime Act, and a patronising Ministry of Culture official.